SENSE is now called Debono Moves! Mary, I just wanted to thank you for your book, Grow Young with Your Dog, and the Connected Breathing Meditation. 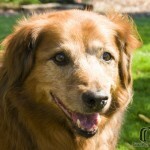 “My 17 old dog, Emmi, had survived a year and a half from cancer and losing half her liver. Last July she started to decline and was having respiratory distress. I did the Connected breathing meditation with her. She seemed to relax , her breath eased. She passed a week later but the meditation gave us both relief, and connected us forever. She died peacefully asleep next to me. 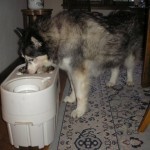 Nikki is a beautiful 11 1/2 year-old Alaskan Malamute who had gradually lost the strength and coordination of her hind legs, making walking and even standing very difficult for this large dog. In addition, her left front paw would knuckle under, causing Nikki to stumble and fall. Since standing was so difficult for Nikki, Ron and Paula had to hand-feed Nikki and squirt water into her mouth from a sport bottle while she was lying down. Neither steroids nor non-steroidal medications (NSAIDs) were effective in helping her regain her ability to stand and walk easily. Since Nikki wasn’t responding to medication and her quality of life was poor, her family was heartbroken at the prospect of losing her. They thought that they were out of options for their beloved dog. Luckily, Ron discovered Debono Moves on the internet. Happily, one session with Mary produced significant improvements, as noted in Ron and Paula’s note above. Nikki continued to improve and you can see how well she is moving in the short video clip below. Ron and Paula call her their “miracle dog”! To see Nikki for yourself, please view this short video. 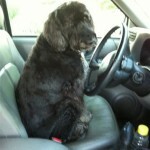 She truly is a “Debono Moves Miracle Dog”! I first brought Roscoe to you because he was having lots of stiffness and pain from arthritis. He is 13 years old and also has Diabetes Insipidus which has severely curtailed his activity level. Roscoe absolutely loves his Debono Moves sessions and I have noticed so much improvement in his walking. He has stopped favoring his right front leg and he really wants to go for walks (although short) once again. 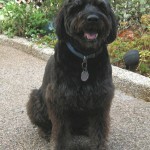 And he is getting up the steps to our house easier than before and navigates the doggie door to the backyard with ease. 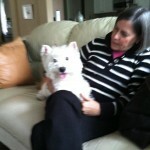 Tony is a West Highland Terrier who was attacked by a coyote about 18 months before I met him. The neurological damage he suffered was so severe that the emergency veterinarian suggested that he be euthanized. Thanks to his caretakers’ diligence and treatment, Tony did recover, although he still was not using his right front leg well. A Debono Moves session 18 months after the injury helped him use his right front leg more effectively. “Hi, Mary: My name is Tim and I am a disabled veteran with PTSD. 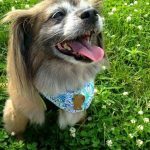 My service dog Pax gets overwhelmed with my symptoms and pulls away from me when I lead him. I feel sometimes I take and ask so much of him, he gets burned out. I watched your video and now he is following me everywhere. I did Debono Moves on his neck in the sit position and he went to sleep in my hands, still sitting up. You are on to something big, if people would slow down and listen to their animals. “I know I’ve said it before, and I’m sure I’ll say it again – you are incredible. What you are able to do is amazing. “I could tell even last night how much better Misty felt. This morning she is feeling soooo much better. She is smiling again, she always smiles when she feels good. She wants to play again and is biting at my dangling hand as we walk down to the feed the horses, something she does when she feels happy and playful. I’m keeping her quiet and letting her rest – against her wishes. It’s so wonderful to see how much better she feels already. I love it when she smiles. (Sept. 2017) I recently had the honor of giving a Feldenkrais® lesson to world-renowned veterinarian and Michigan State University professor, Robert Bowker, VMD, PhD. Horse feet geeks (like me!) are probably familiar with Dr. Bowker’s ground-breaking hoof research. About seven years ago, Dr. Bowker had a severe, debilitating injury to his left upper leg. 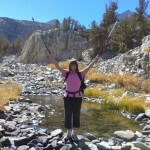 Despite physical therapy and surgery, walking has been difficult. Robert shuffled a lot and stumbled every few steps. He even had to look down at the ground to move forward. Because of the lack of power in his left leg, he didn’t walk in a straight line. After our one-hour Feldenkrais session, Dr. Bowker stopped stumbling. He could walk in a straight line and no longer had to look at the ground. Without any extra effort, his legs lift higher. He’s able to cover more ground and walking is enjoyable again. 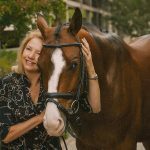 “The morning before I was to ride with a well-known dressage clinician, Vicky introduced me to your Feldenkrais® Awareness Through Movement® lessons (exercises). We did one of your exercises that you created specifically for riders. “It was amazing. I was so glad she had shared that with me, as I managed to get my hip into a position I know I could not have managed without those exercises. It was fateful! “My little Morgan was not properly broken out, and it has really created a lot of inherited problems. One of which is, if he gets a little out of balance, he RUNS. 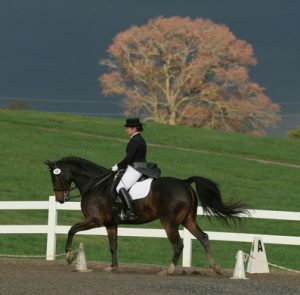 “So this time when he bounded off, I was determined to not brace, but in the past even that doesn’t always work, but with the help of your exercises, I managed to get my outside hip in place, and in one stride, literally, he was doing a lovely light collected canter I could begin pirouette work from. Sorry for the long story, but it was dramatic, and then when we were working half pass, I was also able to get my outside hip in the right place and got some respectable half pass work as well. 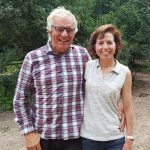 “Having had some time to think and process what has transpired in the days since attending your SENSE Method course, I would like to say that you have contributed hugely to giving me my quality of life back. “I am thrilled and amazed at how quickly my mind and body has integrated the movements and that I am now almost totally pain free. Unbelievable that it went that fast. I have had whole body pain for about 5 years. How that debilitates a person. 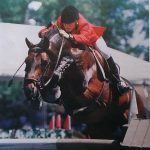 “I also enjoyed the many connectionsthat were brought together, including how important it is for a horse to have feet that are balanced and pain free. You are the first that has commented on it as a clinician and supported it. That was so awesome. “Hi Mary, I purchased the video “Empowering Hips” and followed along last night. Thanks so much! It was very interesting to feel how my body moved differently afterwards. “Thank you again for a wonderful clinic. I learn so much on many levels when I attend your clinics. “You are a wonderful teacher and mentor. At the same time, you become the student learning from your students’ knowledge and experiences. I honour that in you. It is a joy to spend time with you. “Thanks for a wonderful session! It was so much fun to see Maui having fun. She looked so happy and excited to learn. Thank you so much, the SENSE workshop was fantastic. Lots of new learning, techniques and awareness to share with my horse. The Feldenkrais movements have been so beneficial for me. I really liked the focus on me the rider. This past week, I definitely noticed a positive difference in my riding and balance. I’ve been doing the ATM’s you included in your booklet, thank you again! “Hi Mary, Just wanted to say thanks again for the wonderful experience of attending your workshop. It is comforting to find a process that enables us to overcome many roadblocks that we encounter in life and with horses. I love your positive philosophical approach and your genuine desire to infuse us with your knowledge. The ATM’s were very rejuvenating, I can understand how easy it is to become a loyal follower of Moshe Feldenkrais. First of all, I am really enjoying the Rollercise video. I haven’t used it nearly enough and it took me ages to get organized about purchasing the roller and downloading the video, but I am amazed at how I feel when I finish. It honestly feels as if the floor is coming up and wrapping itself around me. It absolutely stunned me the first time it happened!! Also, I am incorporating more and more of your work into what I do with the horses. I’m loving starting and ending with rocking; it is so rewarding to see the changes in the horses’ mobility after they’ve been worked on. “Mimi was able to lie down to sleep and roll right after her first SENSE session! 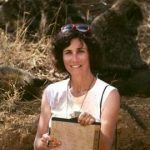 “If you missed the Chapter-sponsored clinic with Mary Debono, Certified Feldenkrais Practitioner and Creator of the SENSE Method, you missed a GREAT clinic! Our Feldenkrais clinic on November 5 was a sell-out and hugely rewarding for the participants. 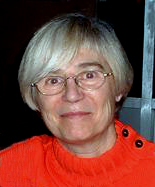 – Rebecca Gill, VA, U.S.
– Donna, San Diego, CA Donna had spine surgery for a ruptured disc, a knee replacement, a total of three knee surgeries, has been diagnosed with degenerated discs and arthritis in her spine and several other joints. She had been receiving steroid injections in her back for pain relief. My first experience with Mary Debono’s work was after I had severely injured my back a few years ago. I had tried standard treatments — a visit to the doctor, drugs, chiropractic and physical therapy. I was in such pain I could not stand up and had to navigate life in the “C” position. Sciatica set it and nothing helped. During a wonderful summer family reunion in the Tetons, while other people hiked, rafted and kayaked, I sat and read Anna Karenina. I am a very active person, and this back thing was really depressing. I had never before been out of commission so thoroughly. “I was considering acupuncture when a fellow equestrian recommended Mary. She was so enthusiastic about how Mary had changed her life that I made an appointment. “I was surprised by Mary’s method. Contrary to the pain inflicted by physical therapy, Mary was extremely gentle. She allowed no movement that would cause the slightest discomfort. However, the gentle pressure she exerted on precise spots caused my spasms to subside. My back started improving immediately, and after several sessions I was feeling much better. As I continued to work with Mary, she taught me how to move more efficiently so that I would not stress my back. To me, Feldenkrais has been nothing short of a miracle. I recommend Mary constantly to friends who complain of back pain and I have even pressed her business card on strangers I overheard complaining of back pain! 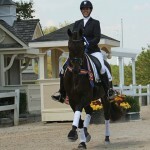 “Mary also works on my aging Grand Prix dressage horse and he loves to see her coming. He is able to move much more freely after she works on him. “I am a 22-year-old girl, hoping to turn riding horses into my career one day. The more I am working towards my goal, the more I realize that my most important asset is my body. “Mary Debono’s work has helped me tremendously regarding body awareness and body coordination. Due to the new found ways of moving my body, I have been able to ride differently, but also use my body in a more beneficial way on a day-to-day basis. For example, I am now able to move my neck separately from my shoulders and turn in the ribcage while maintaining an upright position when driving in the car. “I have walked out of a session feeling taller, to the extent that I would see landscaping marks up on the hills that I have never seen before. After another session I’ve had to adjust the mirrors in my car, because I would look right over them. Another time I could feel both of my shoulder blades touch the back of my car seat consistently for the entire drive home, which is something I’ve never been able to feel before. I had an amazing day yesterday following our session. All day I experienced the sensation of cool water flowing across my upper back and shoulders. Much to my surprise, I found swallowing and my neck movement much more free, though prior to our session, I was unaware of feeling constricted. There is no pain in my foot on rising today. I am notorious for my capacity to disassociate to manage mental and physical discomfort, a skill learned early and utilized often. While I am aware of this tendency, I am not always aware that I have disengaged from my experience. In fact, most often, I am not aware, so your work yesterday was spot on, so gentle, totally compelling and profound. Thank you so much for opening the door to this process for me. I have been too long running down the road with no practice in place to manage myself, if you understand my meaning.